Is the Tax Code the Proper Tool for Making Higher Education More Affordable? Download SPECIAL REPORT No. 220: Is the Tax Code the Proper Tool for Making Higher Education More Affordable? Education tax credits have grown from a $4.5 billion program claimed by 4.7 million taxpayers in 1998 to a $17.4 billion program claimed by over 7 million taxpayers in 2011. Despite the use of tax credits, in the last decade student loan debt rose from just over $400 billion to nearly $1 trillion in 2012, while the cost of college rose 70 percent. Colleges have intimate knowledge of each student’s or family’s needs for tax credits, loans, or other financial aid, which allows the colleges to capture the maximum value of tax credits. Education tax credits are not well targeted toward low- and middle- income families; roughly 30 percent of the current benefits of education tax credits accrue to taxpayers earning over $100,000 and an additional 18 percent accrues to those earning over $75,000. The overuse of tax credits by the federal government has turned the IRS into a spending agency, with refundable tax credits projected to double to nearly $200 billion in the next five years, largely due to the Affordable Care Act. Trading the elimination of education tax credits for lower marginal tax rates would grow the economy by $19 billion per year and create 121,000 jobs. Congress should consider other solutions to lessen the burden of tuition costs, such as increasing saving opportunities in the tax code, expanding pre-paid tuition plans to keep cost down, or reinvigorating well-targeted programs like Pell Grants and direct loans. Recently, college affordability has been on the minds of many. Over the past decade, the cost of college tuition has outstripped both inflation and income growth. On top of that, students are grappling with an ever-growing burden of debt. Considering the financial benefits of getting a college degree, lawmakers have sought to help students afford the cost of higher education. Traditionally, this was done through loan programs and direct subsidies such as Pell Grants. However, higher education policy has shifted in recent years away from traditional loan and direct subsidy programs toward the use of various tax credits. The question now is whether the tax code is the proper tool to increase access to higher education and make college more affordable. First, these tax credits violate the principles of sound tax policy by greatly increasing the complexity and distortions in the tax code. Since the first education tax credit was enacted in 1997, the government has greatly increased the size and scope of education tax credits. However, there is little evidence that they have accomplished what they intended to do and more evidence that they may be fueling higher costs and simply becoming a windfall for colleges, not students. Education tax credits are not well targeted. Although they reach lower income individuals more than deductions, they still tend to benefit high-income taxpayers much more than low-income families. The overuse of tax credits has turned the IRS into an extension of—or substitute for—other government agencies. The IRS is not equipped to be a social welfare agency. As a result, these credits are prone to fraud and improper payments, placing an excessive burden on the IRS. Trading the elimination of education tax credits for lower marginal tax rates is good for economic growth, which is better for all Americans. Our Taxes and Growth Model suggests that such an exchange would boost GDP by about $19 billion, federal revenues by $4.5 billion, and increase employment by about 121,000 full-time workers. We know the current system isn’t working, so what is the solution? Options consistent with tax reform should include: Simplifying the vehicles for saving within the tax code, perhaps through universal saving accounts, and encouraging new markets that will incentivize colleges to keep long-term costs down, such as pre-paid tuition plans. Finally, a better option to help low-income students is to shift resources out of “tax programs” and into established programs like Pell Grants. In the scope of federal assistance for higher education expenses, tax credits and deductions are relatively new. Prior to the enactment of the Hope Scholarship Credit and the Lifetime Learning Credit in 1997, the government’s primary tools for helping students had been direct assistance (such as the G.I. Bill and Pell Grants) and loan programs. Since 1997, however, lawmakers have increasingly turned to the tax code to help students and families with education costs. 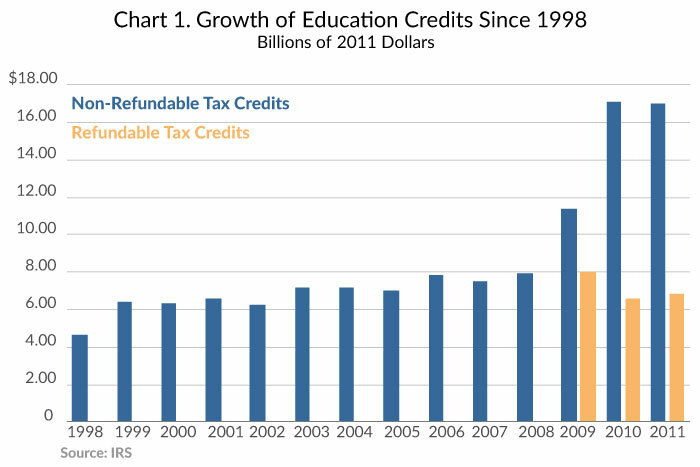 Chart 1 illustrates the gradual growth of the budgetary costs of education tax credits since 1998, while Chart 2 documents the number of tax returns claiming those credits each year since 1998. In 1998, some 4.7 million taxpayers claimed $4.5 billion in credits, after adjusting for inflation. Within five years, the number of taxpayers claiming these credits had climbed to over 7 million, while the inflation-adjusted costs increased to over $7 billion. The average taxpayer claimed roughly $1,000 in education tax credits. The cost of these programs held steady until the enactment of the American Opportunity Tax Credit (AOTC) in 2009. The AOTC is more generous than the Hope Credit—it covers the first $2,000 of education expenses compared to $1,200 for the Hope Credit. It also allows taxpayers with higher incomes to claim the credit—it phases out at $180,000 for joint filers compared to $120,000 for the Hope Credit. Finally, the AOTC was made refundable for those with no income tax liability. As can be seen in Chart 1, the inflation-adjusted cost of non-refundable education credits jumped from $8.1 billion in 2008 to $11.4 billion in 2009 and then to $17.4 billion in 2010. Moreover, the IRS distributed $8 billion in refundable American Opportunity credits in 2009 and another $6.7 billion in 2010. Meanwhile, as is shown in Chart 2, the number of taxpayers claiming various education credits more than doubled between 2008 and 2011, from 7.7 million to over 18 million. In 2011, some 8 million taxpayers received refundable AOTC credits. As the size and scope of education tax credits has been expanding, students have still been facing increasing costs. 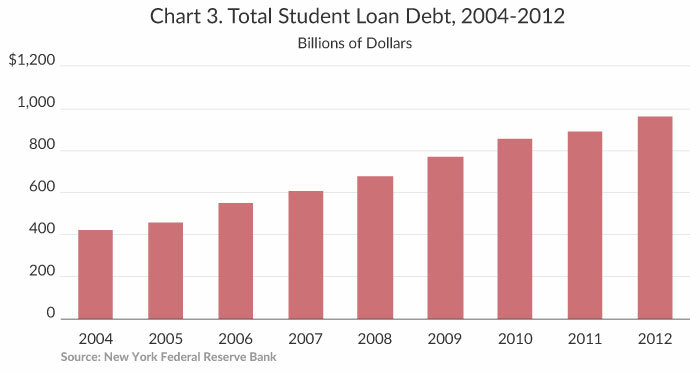 This is indicated by the fact that student loan balances have increased greatly in the past decade. Chart 3 shows the growth in the total student loan debt. From 2004 to 2012, the New York Federal Reserve Bank estimates that total student loan debt has increased by 129 percent. In fact, the New York Fed found that student loan debt was the only type of consumer debt that continued to increase during the recession of 2008. It is now the largest single type of outstanding debt, larger than both credit card debt and auto loan debt. This increase in debt isn’t entirely due to an increase in the number of students going to school. The debt load per student also has increased drastically. Chart 4 shows the growth in per student debt from 2004 to 2012. According to data from the New York Federal Reserve Bank, the debt per student has grown by 35 percent to $24,800 per student in 2012. The growth in cost of a college education has far outstripped inflation in the past decade. Chart 5 compares the growth of the cost of tuition to both median household income and inflation. College tuition plus room and board has grown by approximately 70 percent in the past decade. This has greatly outpaced the growth in household incomes (17 percent) and inflation (27 percent) over the same period. This increase in debt, even in the face of more generous education tax credits, indicates that current policy is not addressing the fundamental issue, which is the wild growth in the cost of college. It is likely that instead of helping, tax credits may be contributing to the rising cost of college education. The market for higher education is like no other in the private sector. Colleges are what economists call price discriminators because they can maximize the price that each student can pay. In higher education, the seller of the good (the college) has perfect information on the buyer (the student) and, unlike most sellers, they can not only choose which buyer they prefer, but set a different price or funding mix for each buyer. Because of the Free Application for Federal Student Aid (FAFSA), the college has intimate knowledge of each student’s (or family’s) income and assets and therefore knows to what extent a student’s family can afford college and if they are eligible for tax credits, loans, or other financial aid. This information allows the college to simply adjust its financial aid package in order to capture the maximum value of the tax credit. Instead of being a helping hand for students, tax credits have turned into a windfall for universities. The stated goal of these credits is a help students from low- and moderate- income families pay for the ever-increasing cost of college. However, it is not clear that they are accomplishing that goal. In fact, tax credits end up going to students that likely could have afforded college anyway. Even more, these credits direct taxpayer dollars to future high-income individuals. 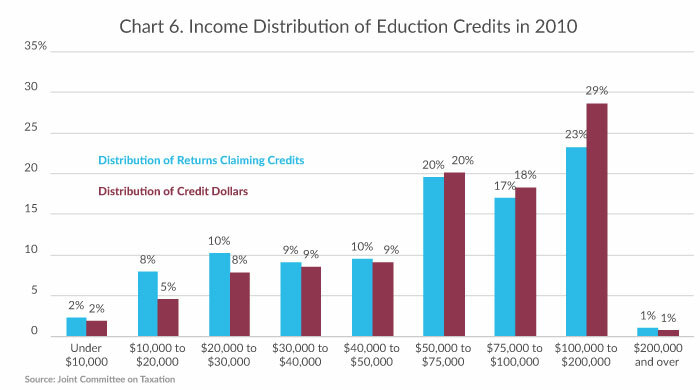 As Chart 6 illustrates, roughly 30 percent of the current benefits of education tax credits accrue to taxpayers earning over $100,000 and an additional 18 percent accrues to those earning over $75,000. In contrast, only 20 percent of those who claim education tax credits earn under $30,000. By most accounts, these tax preferences are becoming upper-middle-class entitlements. Even more, these tax credits are directing dollars to future high-income individuals. As can be seen in Chart 7, the median income for a worker with a four-year college degree was $75,568 in 2010. By contrast, the median income for a worker with only a high school diploma was nearly half as much—$38,976. 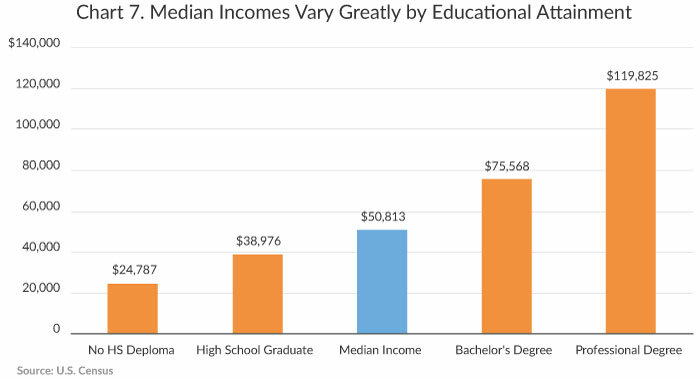 There is even greater income disparity between those with high school diplomas and those with advanced degrees. In other words, many tax credit dollars are going towards future doctors and lawyers: those who would be more likely than not be able to pay back a loan. To some degree, these benefits accrue to educated professionals at the expense of taxpayers who may never visit a college campus. In many respects, this amounts to reverse redistribution up the income ladder. The growth of education tax credits has been part of a larger trend towards using tax credits—especially refundable tax credits—for a number of government priorities. Chart 8 shows the total budgetary costs of refundable tax credits from 2006 to 2013 and the projected costs to 2017. 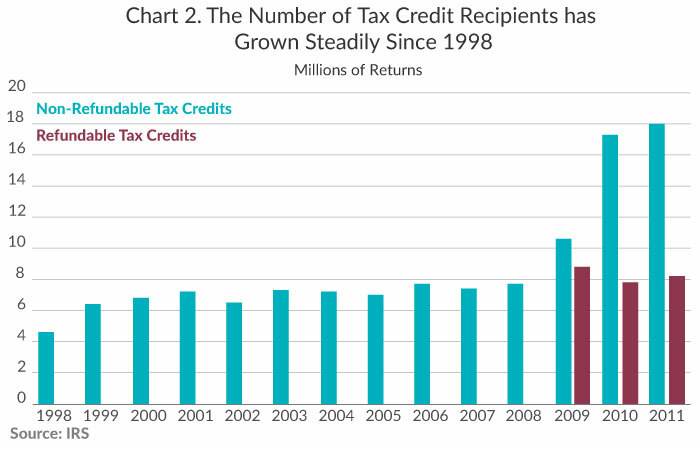 In 2013, the total cost of refundable tax credits was close to $96 billion. This includes $61 billion for the Earned Income Tax Credit, $30 billion for refundable portion of the Child Tax Credit, and $4.5 billion for the refundable portion of the American Opportunity Credit. In the next five years, the total cost of refundable tax credits will double to nearly $200 billion due entirely to the Affordable Care Act. Clearly, the IRS has become an extension of different government spending agencies, a job that it is not equipped to do. The use of tax credits increases the cost of compliance for taxpayers and the IRS, and as a result they are susceptible to error and fraud. This is demonstrated by the high levels of improper payments in these tax credit programs. As it stands, simply complying with the tax code costs taxpayers an estimate $163 billion each year. About 62 percent of all taxpayers use tax return preparers, but the percentage climbs to about 73 percent for those claiming the EITC, for example. 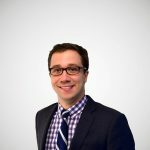 The complexity of EITC eligibility is a contributing factor to the estimated $11 billion to $13 billion in improper overpayments according to the IRS. [t]he IRS requires no documentation to be provided to verify eligibility, including whether an individual claimed as a student even attends a required accredited educational institution. Our review is identifying significant improper payments being made to taxpayers claiming the credit and using ineligible students. Enforcing these credits is simply asking the IRS to be more than a tax collection agency. It is asking it to manage a social program—a role far beyond what it is designed to perform. As we think about tax reform—which generally means broadening the tax base while lowering tax rates—it is reasonable to consider the economic effects of trading the elimination of tax credits for lower tax rates for all taxpayers. 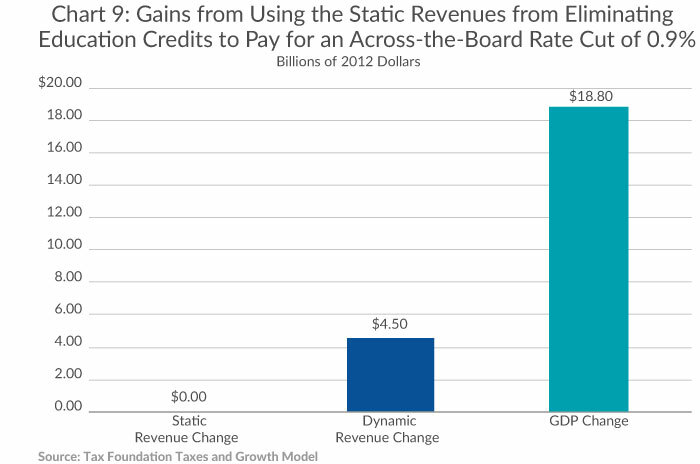 Tax Foundation economists used our Taxes and Growth (TAG) model to measure the long-term effects of eliminating all education credits and using the revenues to cut marginal tax rates across the board. Our findings were quite illuminating. So, in addition to reducing complexity and simplifying the tax code, trading education credits for lower tax rates for everyone would not only boost GDP and jobs, it would benefit the Treasury as well. By any objective measure, that would seem like a very good exchange. Current policy has not achieved its goal of making college more affordable. 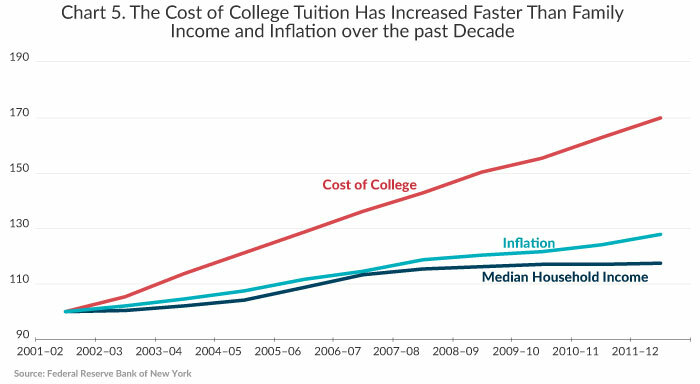 Over the past two decades, the cost of college has risen faster than income and inflation. It would appear that all of the tax credits created since 1997 have become more of a windfall for colleges than for students, thus actually fueling higher college costs. There are two good solutions, one within the spirit of fundamental tax reform, and the second with the goal of encouraging free-market mechanisms that will force colleges to control their costs over the long term. As we look to overhaul the tax code, we would do well to simplify and expand the available savings vehicles for families and avoid micromanaging family savings decisions by increasing the number of targeted savings options. College savings programs such as 529 plans are excellent, but they are pitted against Health Savings Accounts (HSAs) and Individual Retirement Accounts (IRAs), which forces families to separate their savings into different buckets and lose some of the growth potential from that savings. Tax reformers should consider consolidating these different vehicles into a universal family savings plan would allow families to choose where best to direct their savings. Saving for college is far superior than trying to pay for college with loans financed against uncertain future earnings. However, savings accounts do not act as a market mechanism to force colleges to control future costs. One mechanism that can effectively do this is the variety of 529 plans that allow parents, grandparents, or students to lock in college costs through pre-payment arrangements. Not only do these plans provide families certainty, they require colleges to control their costs as much as eighteen years in the future—something that tax credits, subsidies, and loan programs not only don’t do, but actually discourage colleges from doing. Currently, seventeen states have pre-pay elements to their 529 programs for their public universities, while more than 270 private colleges have collaborated in their own 529 program with a pre-pay option. Finally, if the goal is to help low-income students with college costs, it would make far more sense to shift resources away from tax programs like credits and focus the funds on spending programs like Pell Grants which are more targeted and less susceptible to improper payments and fraud. While we all understand the value and financial benefit of getting a college degree, using the tax code to make college more affordable not only violates the principles of sound tax policy but also doesn’t have the desired effect. These tax programs—for lack of a better term—are failing to address the underlying reasons for the increase in college education and are likely contributing to the rising costs of higher education. These credits, which cost billions, may not even be helping the people that lawmakers intended while transforming the IRS into an extension of the Department of Education and the social welfare system. It’s time we consider other solutions that don’t require us to use the IRS as a spending agency, especially as we prepare for a comprehensive overhaul of the federal tax code. For a short history of federal assistance for higher education costs, see Urban Institute, Elaine M. Maag & Katie Fitzpatrick, Federal Financial Aid for Higher Education: Programs and Prospects (Jan. 2004), http://www.urban.org/UploadedPDF/410996_federal_financial_aid.pdf. Federal Reserve Bank of New York, Donghoon Lee, Household Debt and Credit: Student Debt (Feb. 28, 2013), http://www.newyorkfed.org/newsevents/mediaadvisory/2013/Lee022813.pdf. National Taxpayer Advocate, Report to Congress: Fiscal 2010 Objectives at xxii (June 30, 2009), http://www.irs.gov/pub/irs-utl/fy2010_objectivesreport.pdf. Hearing on Improper Payments in the Administration of Refundable Tax Credits, Hearing before the Subcomm. 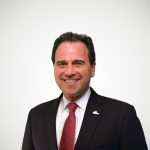 on Oversight of the H. Comm. on Ways and Means, 112th Cong. 3 (May 25, 2011) (statement of J. Russell George, Treasury Inspector General for Tax Administration), http://www.treasury.gov/tigta/congress/congress_05252011.pdf [hereinafter George Testimony]. Treasury Inspector General for Tax Administration, Improvements Are Needed in the Administration of Education Credits and Reporting Requirements for Educational Institutions, Ref. No. 2009-30-141, at 2 (Sept. 30, 2009), https://www.treasury.gov/tigta/auditreports/2009reports/200930141fr.pdf. See George Testimony, supra note 4, at 7. Michael Schuyler & Stephen J. Entin, Economics of the Blank Slate Series, Case Study #8: Education Credits, Tax Foundation Fiscal Fact No. 386 (Aug. 6, 2013), https://taxfoundation.org/article/case-study-8-education-credits. Private College 529 Plan, https://www.privatecollege529.com.